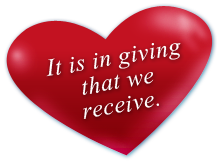 ...just some of your daily blessings were collected for an individual or entity in need? Introducing "The Giving Glass", the conduit of kindness. The Giving Glass is a way in which your intended acts of kindness can be collected by filling the glasses with coins or anything of value you wish to save for a person or organization in need. By giving your collected blessings, your act of kindness will make a difference. When added up, they can change the world. Order your Giving Glass today, "because it is in giving that we receive". See "Click Here to Order"